There are many an issue in the world today… Who knew snack foods would be headlining at some point? Flamin’ Hot Cheetos are making quite a stir in the universe of news for their addictive qualities. The States to us Canadians are often like a mystical land full of adventure, intrigue, opportunity and, at times, sheer horror. No, we’re not talking about Mitt Romney or Honey Boo Boo… Not this time, at least. This is an issue of the devouring kind, and it comes in the physical form of a snack called Flamin’ Hot Cheetos. If you’re unfamiliar, this snack (not sold in Canada) is akin to the regular Cheetos but covered in red dye, spice, a truckload of salt and what we can only assume to be some kind of highly addictive drug. Well, down in the United States, Flamin’ Hot Cheetos is quite a popular snack, and now several schools in California, New Mexico and Illinois have found the path of righteousness and banned these greasy, corn-starch sticks hatched from the fiery pits of the underworld. The schools cite lack of nutritional value as the driving force for the ban. How bad is it? Well, one snack-size packet contains 26 grams of fat and nearly a quarter of the recommended daily consumption of sodium. In terms of fat, that’s worth about three Mars chocolate bars, crammed into a single, tiny packet of Cheetos. Here’s a really frightening bit of information, though. According to emerging research, hyperpalatable foods (sweet, salty, fatty) can prompt similar brain responses as those observed in individuals addicted to alcohol and drugs. 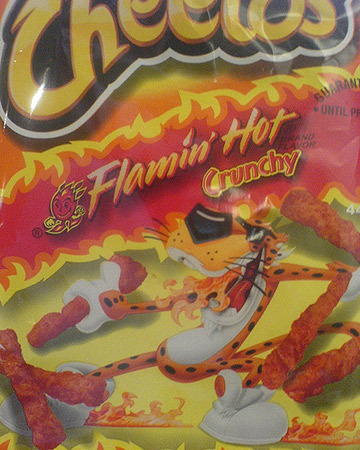 So compulsive eating of snacks like these Flamin’ Hot Cheetos will make your brain go as wacky as if you were a cocaine user. “A number of patients who have consumed these Cheetos in excess have complained of pain in their upper abdomen, rising up into their chest, likely due to the red peppers and spice contained in the snack,” Dr. Robert Glatter, an emergency medicine physician for Lenox Hill Hospital in New York, told CBSNews.com. But if you’re sitting on that high horse, get off. Any prissy judgment dealt to the U.S. for allowing such heinous snacks to be sold in the first place unfortunately almost applies to us. There is actually a Canuck petition to lobby the government for permission to import Flamin’ Hot Cheetos to the country and several Facebook groups supporting it. Yes, there is war and famine all over the world, but this is what the good people of Canada would like to see change. Process the beautiful information above, embrace it, and tell us what you think.